Emirates is playing its part in the build up to the 2019 cricket World Cup with one of the airline’s Airbus A380s featuring a cricket-themed livery unveiled in Dubai on Tuesday (UAE time). 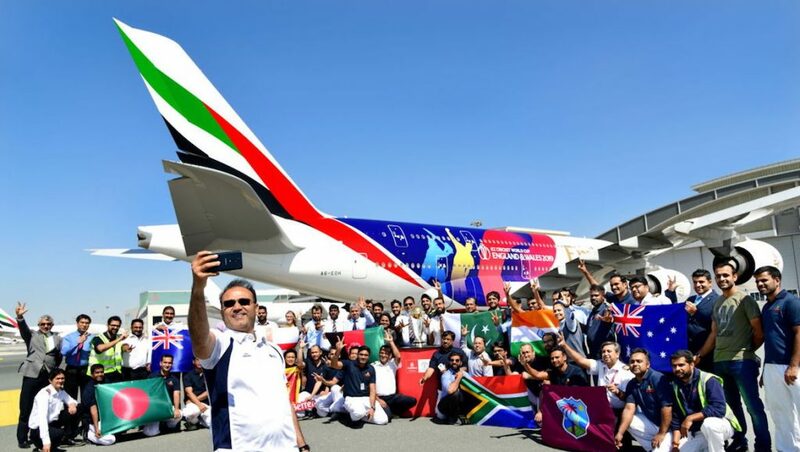 Retired Indian cricket Virender Sehwag among the first to get a close look at the aircraft, registration A6-EOH, when he met Emirates engineering staff who had worked on installing the 2019 cricket World Cup logo decal splashed across A380 fuselage. The batting champion, who brought the International Cricket Council World Cup trophy with him, also took time out for an informal game of cricket with the engineers alongside the aircraft, supported by Lancashire team players Saqib Mahmood and Tom Bailey. 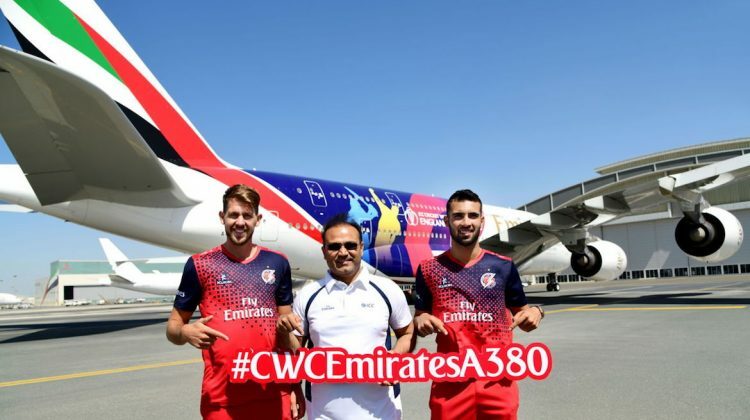 Emirates said the A380 will be flying to London and Manchester – the England and Wales are the co-hosts of the tournament that kicks off in May – as well as big cricket markets such as Australia, New Zealand, Johannesburg in South Africa and Mumbai in India. 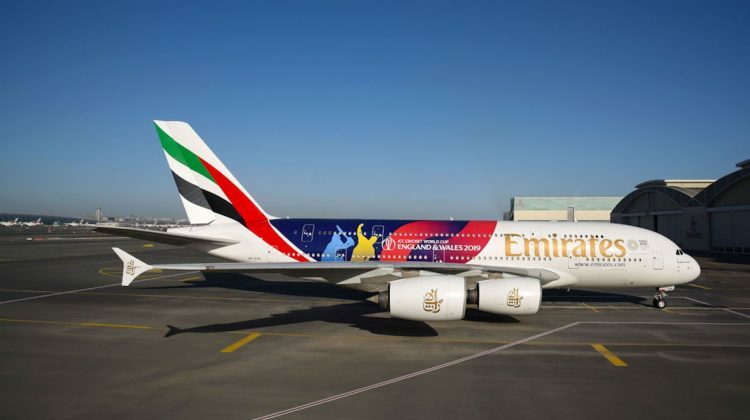 Emirates divisional senior vice president for corporate communications, marketing and brand Boutros Boutros said the airline was proud to be the official airline for the cricket World Cup. “Today’s reveal takes us one step closer to bringing the tournament to life for the nations competing in the ICC Men’s Cricket World Cup 2019, and for cricket fans across the globe,” Boutros said in a statement. 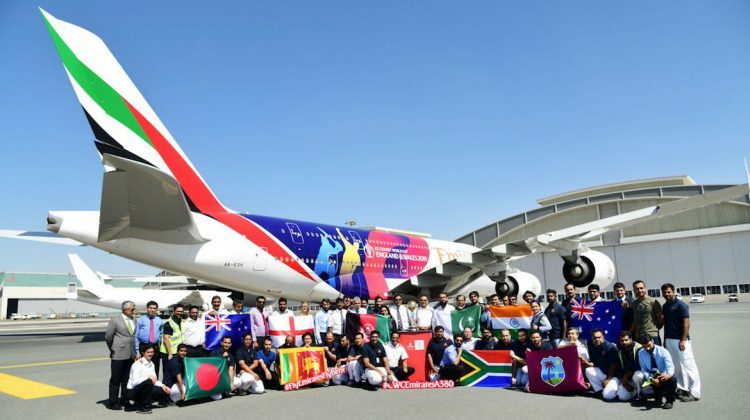 The cricket World Cup kicks off on May 30, with 10 teams striving to lift the trophy when the tournament concludes with the final at Lord’s Cricket Ground on July 14. The competing teams comprise Afghanistan, Australia, Bangladesh, England, India, New Zealand, Pakistan, South Africa, Sri Lanka and the West Indies. I guess the possible upside to this is that it’s easier to fall asleep on board. Have to say that I love their idea of a “World” Cup. All 9 Nations of the world.